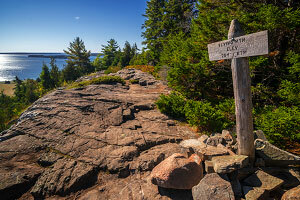 Located in the same pantheon as Acadia Mountain and St. Sauveur Mountain, Flying Mountain is the shortest labeled peak in Acadia National Park. Despite its comparatively small size, a hike up Flying Mountain offers terrific views from the top of the peak and also leads to the wonderfully secluded Valley Cove, a secluded section of shoreline that entices people to dip their feet and relax. A loop hike up the Valley Peak Trail to the top of St. Sauveur Mountain can turn this into a longer adventure with terrific views down into Somes Sound all along the way. IMPORTANT: Sections of this route, including the Valley Cove Trail and the cliffs under Valley Peak, are often closed between March 15 and August 15 for peregrine falcon nesting. (Closure signs are posted at the trailheads.) Please respect these closures and check trail status with the National Park Service. Rating: Easy day hike for the short Valley Cove Loop; fairly strenuous day hike for the longer Valley Peak Loop. Access: Flying Mountain Trailhead on Fernald Point Road off of Route 102. 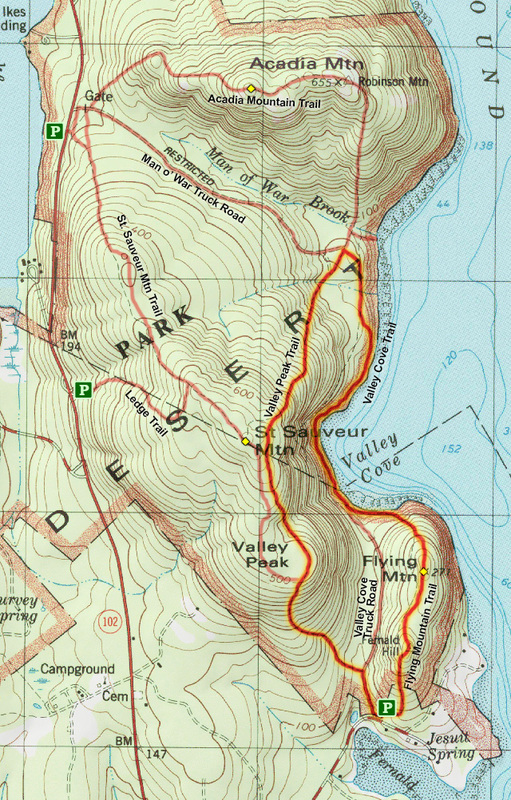 Time Required: 1-2 hours for the short Valley Cove Loop; 3-4 hours for the longer Valley Peak Loop. Length: 1.5 miles for the short Valley Cove Loop; 3.1 miles for the longer Valley Peak Loop. Elevation Change: 200-ft elevation gain to summit of Flying Mountain; 500-ft elevation gain to summit of St. Sauveur Mountain. Seasons: Late summer through fall. To find the Flying Mountain Trailhead, drive south on Route 102 roughly 1.5 miles south of the St. Sauveur (Ledge Trail) Trailhead and then turn east on Fernald Point Road and follow it .8 miles to the well-marked parking area. Note that this corner of Acadia National Park borders on private property so please be respectful and do not trespass or block anybody's driveway. The Flying Mountain Trail heads up the forested south face of the peak and in a matter of minutes you will be standing at the summit marker. Even though Flying Mountain is only 284-feet high, the views from the exposed granite summit are surprisingly beautiful! Continue along the trail as it turns west and descends to Valley Cove, a wonderful oceanside spot for relaxing and enjoying the water. For those looking for a really short hike, hike the Valley Cove Truck Road back out to the parking area. If you are looking for a longer adventure, continue north on the Valley Cove Trail. 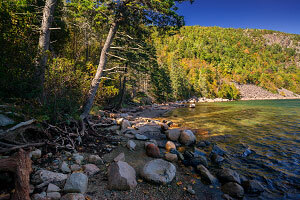 As the Valley Cove Trail heads north, it passes through a long boulder field that flows into Somes Sound. Here's where the work begins! The trail navigates the boulder field, then heads up and down several times to circumvent various obstacles along the coastline. This section of trail may get tedious, but several spots offer terrific views looking back at Flying Mountain. Soon enough, the trail eases up and we reach the four-way intersection with the Acadia Mountain Trail and the Valley Peak Trail. Take the Valley Peak Trail as it heads back south and ascends St. Sauveur Mountain. Along this stretch of trail are several outstanding views looking down at Valley Cove. Soon enough you will be at the top of St. Sauveur Mountain; if you want to be thorough, you can take the St. Sauveur Mountain Trail west just a bit to tag the viewless summit marker. Continue down the east spur of the Valley Peak Trail for even more great views as the trail descends to Valley Peak. For the final stretch of the hike, the Valley Peak Trail continues down the south face of Valley Peak and enters a sublime forested area with a few sections of boardwalk planks along the trail. Soon enough the trail intersects with the Valley Cove Truck Road; hike the closed dirt road south back to the Flying Mountain parking area. The loop hike from Flying Mountain to the Valley Peak Trail is a wonderful adventure that takes you to separate peaks and the wonderful shoreline scenery of Valley Cove. This route is arguably more bang for your buck then hiking the St. Sauveur Mountain Trail from the Acadia Mountain Trailhead. Give this one a try!